My friend Devin recently came over to check out my new digs. Upon surveying the territory, she announced, “You’re a good little hipster.” What makes a good hipster, you ask? Apparently, or at least according to Devin, a good hipster is one who does not try to fit the ‘hipster’ persona, they just do. A few days later, my father sent me a Huffington Post article – The 22 Most Hipster Foods On The Planet. Among them were Brussels sprouts, Bacon, Kale, ‘Anything Served In A Mason Jar,’ Tacos, Foraged Anything, Green Juice, and Cauliflower. If there had been any doubt in my mind that Emerson hadn’t successfully transformed me into a hipster, good ol’ Huff Po took care of it. I made this here pasta the other night with no hipster intentions, I swear. When I brought the leftovers to work the next day (not in a mason jar, thank you very much), my co-workers lovingly (they ate a lot of it) deemed it ‘Hipster Pasta.’ By this point, I wasn’t surprised that someone was yet again classifying my food choices as ‘hipster.’ Looking at the data though, they’re right. Pretty much every ingredient could have made it on Huff Po’s list. The Maldon Salt, with which I garnished the dish at lunch, was the icing on the artisanal GF bacon-flavored cake. I don’t even care. And you shouldn’t, either. Whether you’re a good hipster, a bad hipster, or you hate hipsters, this pasta is damn good. It’s super simple, veggie friendly, easy enough to throw together, and makes for great leftovers. It’s the kind of pasta you won’t feel bad for eating – though you should never feel bad about eating pasta. With no heavy sauce or fatty meats, you’re left with rich flavors that combine effortlessly to create a healthy, light, hipster-positive meal. Peel the squash. Cut in half. Remove seeds. Cut squash into 1-inch cubes. 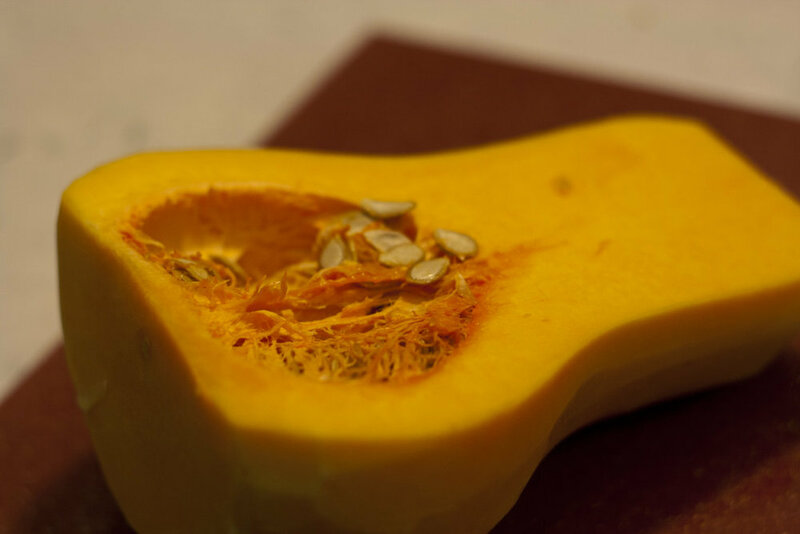 Place squash in a medium-sized ovenproof dish and coat with a bit of olive oil and salt. Bake for 45 minutes or until tender. Boil a large pot of salted water. Cook pasta for 11 minutes, or until al dente. Remove stems from kale and slice leaves into small strips. Heat some olive oil in a large skillet. Add kale and sauté until soft. Drain the pasta and add it to the skillet. 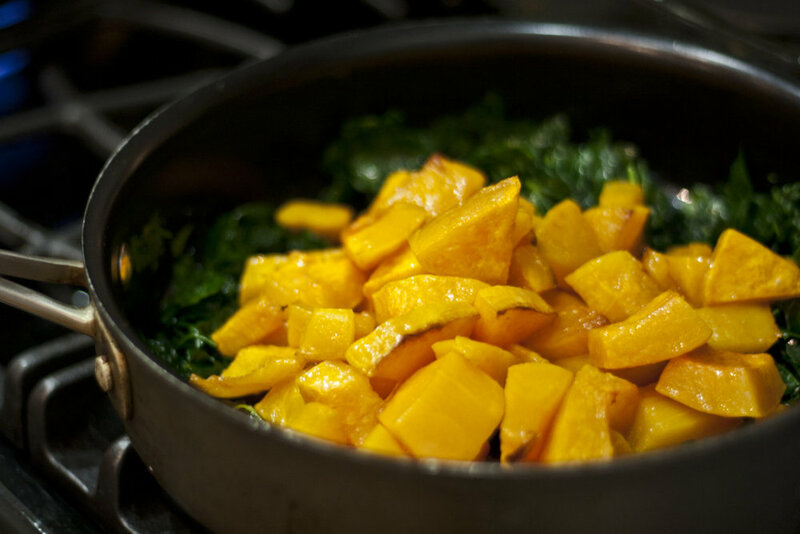 Add squash to skillet. Crumble in goat cheese and walnuts. Toss to combine. Add more goat cheese until desired creaminess is reached.